When a football legend such as the late, great Bob Paisley reserves special praise for you, it’s fair to say you’ve made an impact in the beautiful game. The plaudits in question came from the legendary Liverpool manager for Paul Walsh, who Paisley’s pal and Reds boss at the time Joe Fagan signed from Luton Town in 1984 for £700,000. For the record, Paisley said of the fleet-footed winger: "Walsh can play teams on his own some days. When he's buzzing and bubbling he whizzes around the field like a cartoon character with the ball tied to his boot. It's like watching a film that's running too fast. You want to slow it down in order to appreciate all the tricks he's getting up to. He might beat a defender on the outside, then turn back and go inside him and then beat him once again for luck." More proof, if need, of Walsh’s credentials come when you remember that he made his Anfield debut for the Merseyside giants alongside a certain Kenny Dalglish up front – and, of course, he scored in a 3-0 win over West Ham United. 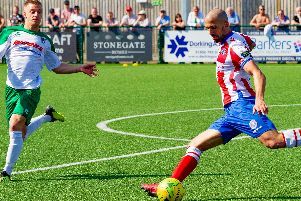 So, it is with some relish that football fans are looking forward to an evening in the company of Walsh, whose son Mason plays for Bognor, at the Rocks' next Sportsman's Dinner on Friday, March 15 at the Seasons clubhouse. Walsh, now a well-respected football pundit with Sky Sports, says he has chosen a Q&A format for the event, so he can share his opinions on the modern game as well as dipping into his past and his colourful and illustrious career. Walsh, who was capped for England five times and also enjoyed spells with Pompey, Manchester City and Tottenham, said: "I think the guests will get more out of the Q&A format with my take on the game currently and not just a load of old war stories! "I started playing professionally in 1979 and so there will be a good few people there on the night who probably weren't even born then and who might not that interested in those days and prefer to chat with me about the game as I see it today. "That's the beauty of with Q&As, they can be great because they take on a life of their own and the guests get to hear more of that they want rather than a formatted talk which I know from personal experience doesn't always necessarily work that well."